Malignant otitis externa is a complication of a problem with the outer ear. This condition known as otitis externa is a common infection of the outer ear that is also commonly referred to as swimmer’s ear. Complications of a disease are the consequences of not treating a condition in time or when the condition progresses for a long period or rapidly where it is either untreatable or the body is not able to slow it down. On its own swimmer’s ear (otitis externa) is not a serious disease. It is irritation and inflammation of the outer ear, particularly the ear canal, when certain bacteria infect the area. Swimmer’s ear is seen in all age groups and is even a common among children. However, malignant otitis externa is a very serious although rare complication of swimmer’s ear. It is more commonly seen in certain people and the elderly are at risk of developing malignant otitis externa. Since malignant otitis externa is a complication of swimmer’s ear, it is important to understand what causes this condition. Normally there are several mechanisms to protect the ear canal which is exposed to the external environment. In this way the internal environment of the ear canal is kept stable, microbes cannot infect it and the skin lining the ear canal and eardrum remains healthy. When this is disturbed the ear canal is prone to various diseases. One of the common causes is excess moisture in the ear canal. This may be a result of perspiration or water trapped after swimming – hence the term swimmer’s ear. Another cause is through excessive cleaning of the ear with cotton swabs and hair pins which removes the ear wax and also injures the ear canal. Otitis externa may also be caused by allergic reactions to hair products that gain entry into the ear canal or with the use of certain ear jewelry. Underlying skin diseases that extend into the ear canal and a weakened immune system may also increase the chance of otitis externa developing. Many different types of microbes can infect the ear canal. Bacteria are the most common cause and particularly Pseudomonas aeruginosa and Staphylococcus aureus. These infections can be effectively treated. Malignant otitis externa is more likely to arise when an infection with Pseudomonas aeruginosa is left untreated or arises in a person with a weak immune system like with HIV/AIDS, uncontrolled diabetes or in a chemotherapy patient. Malignant otitis externa is also more commonly seen in the elderly, especially in diabetics. Severe ear pain that extends deep into the skull (headache). Intense itching within the ear. 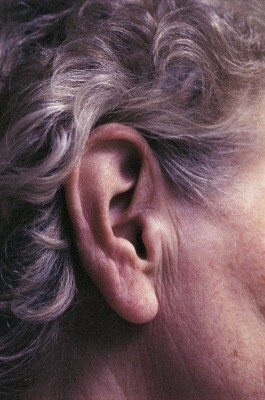 Loss of hearing which may be partial or complete. Pus discharge from the ear which is foul smelling. Facial muscle weakness or even drooping of the face (palsy) on the affected side. Symptoms may also involve the throat once it becomes very severe. Malignant otitis externa is a very serious complication that can be life threatening if it is not treated as soon as possible. Death due to this condition is more frequently seen in the elderly. The condition can however be very effectively treated with antibiotics. This may be administered orally for long periods of time or even intravenously in order to reach the infection which is deep within the tissue. Surgery may be necessary to remove the damaged and dead tissue. There is a risk of the infection returning and it is therefore important to be cautious about any future ear infections, irrespective of how minor it may seem. Malignant otitis externa needs to be treated by medical professionals and cannot be managed in the home environment without medical attention.